No planning updates this week. 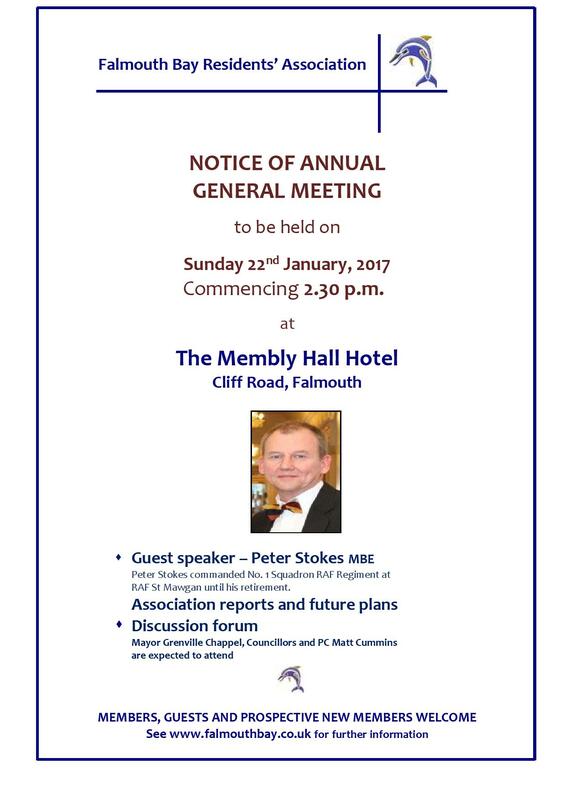 Please see the attached pdf notifying the 2016 AGM to be held at the Falmouth Hotel on Sunday 24th January, 2016 starting at 2:30 pm. Members are asked to note that the Hotel is providing a 10% discount (on their terms that you should review if you take advantage of this offer) for Sunday Lunch on the same day. We suggest that Members taking advantage of this offer seek to have the early sitting for lunch to allow for a more comfortable experience prior to the AGM. The next EC meeting is to be held on Monday 12th October 2015. The below outlines another busy week for the association. The information shown here will also be on the website in the next short period. Go to www.falmouthbay.co.uk your user name for registered (to the website) members is your email address. The password is that which you chose after initial login. Do not despair if you’ve forgotten it. Just quick the forgotten password but ton and follow the instructions. Those who make this journey may find some (nay a lot) of the website is running a tad behind. We need help! See below at the relevant item. Ships & Castles – inertia won’t save it. Act Now! Breaking News: Westcountry Land are, it seems, planning to build in excess of 200 homes on the Menehay Farm Site off Bickland Water Road. Just one for the bay area. See attached pdf. Evidence continues to come in of the above types of vehicles parking alongside the highway especially along Cliff Road and now, it seems, Boscawen Road too. At your Exec Committee meeting held last Wednesday the matter was debated and we are seeking further up to date guidance from the Police and the Ward Councillors. (such as hanging out washing on the pathway; using drains for disposing of materials (use your imagination) and so on. We will continue to monitor but please help by reporting any special instances to secretary@fbra.co.uk. Members might also complain/point out the problems to the ward councillors. Who they? You can find out how to contact them by calling Falmouth Town Council on 01326 315559 during normal office hours. This is in largely the same category as the item above save that this is illegal and only evidence will enable this to be controlled. Please continue to report instance with either video or audio evidence as well as number plates and descriptions as they occur. Secretary@fbra.co.uk gets something done by collating this material and passing it to the police. Again do inform your ward councillor one or all of them as above. Some of you will have seen the headline in the West Briton this week where it seems Cornwall Council are faced with a huge repair bill and are about to look at its available options. mark@falmouthtowncouncil.com (Falmouth Town Clerk: note ask him to forward your comments to Maureen Davies and Steve Gray both Arwenack Ward town councillors). Finally for the moment research requested by Sarah Newton states, amongst other things: 'Local planning authorities should not identify as suitable for housing any land which is subject to severe physical, environmental or policy constraints’. The Headland is subject to severe policy constraints as it is bracketed by Scheduled Ancient Monuments, is in a Conservation area, is zoned for Recreation on Cornwall’s interactive map, is crossed by a public footpath. The attached Cornwall Council Map indicates everything in light blue is identified as Recreation Land. The brown hatched area is Scheduled Ancient Monument as is the blue ’i’ to the left of the car park/ below the leisure centre. Responses to the community questionnaire have been collated and analysed. Four working groups have now been established to draw up proposals and policies in four categories; these being Environment and Open Spaces, Housing and Sustainability, Jobs and Workplaces and Spatial Strategy and Design Guidance. DY has been appointed Chair of the Environment and Open Spaces Group. A meeting will be held shortly to discuss and agree the brief for each WG and establish work programmes. It is anticipated that the NP will be drafted by Spring of next year when it will be submitted for approval to Cornwall Council. If/when it passes this hurdle a referendum will be held; the earliest this is likely to take place is Autumn of next year. All is pretty much in place but we still need bottles, cans, bric-a-brac and etc. Contact Bruce Keer if you can provide the latter (313686) or fete Chairman Elaine Leather (211341) for everything else. Silent Auction details will be sent by email to members in the next short period. Much support from our community and we hope you will find something worth bidding for when the list comes out. Falmouth Civic Society of which FBRA is a member has issued its Summer/Autumn Newsletter. It is attached as a pdf. Other stuff: I’m delighted to let you know that we have our first volunteer who will help with our Newsletter (which will come out at the end of October). Just a couple more of you will make for a more comprehensive offering to members especially if you are able to upload material to our website and to help with research. In this latter connection any of you who have been traversing the footpath between Gyllyngvase and Swanpool on a regular basis over the last fifteen years are asked to contact the secretary secretary@fbra.co.uk or by phone 319110. Below are some of the activities this last week along with the planning update. Please also check out the website at www.falmouthbay.co.uk on a regular basis and inform the webmaster@fbra.co.uk of anomalies or other things you would like to see. See also Item 7 below. It is now widely known that the application was denied unanimously by Cornwall Councillors at their Central Sub area Planning Meeting held last Monday, 6th July. Our Chairman, Ruth Hills, did a splendid job speaking on behalf of FBRA Members as did Candy Atherton (whilst also wearing her hat as Chairman of the Neighbourhood Planning Committee for Falmouth). A big thank you to our research team who did so much hard work in getting the facts explained. The result, whilst always in doubt, was one that should have met a similar fate much earlier. We await a response from Cornwall Councils’ legal department to a clarification letter sent to them by FBRA a week ago. They are probably checking their facts. More news to follow. This is for the application for 6 chalet style homes between the cemetery and Swanpool Café. We are pleased to let members know that, for the moment at least, this application has been withdrawn by GO Planning Ltd whilst they seek clarification from Cornwall Council Planning. Perhaps prompted to do so by the Linden Homes decision? A similar and perhaps more positive argument for dismissal exists. We await further news. An update on the consultation that took place on 10th July will be with you next week. It seems that we will see the beach-side shower (bathers for the use of) being installed on Gyllyngvase Beach in the next few days. Boots the Chemists on Market St is to open until 7pm Monday through Saturdays until September. The below first appeared last week. We really do need some help so if you can spare some time, just a couple of hours, it will help to improve the website, advise your committee and etc. Contact your nearest friendly committee member if you can do something. Probono assistance in understanding the Highways Act and planning legislation – a big ask but if we don’t then we may find it difficult to be sure of our facts as we sometimes battle on your behalf. IT assistance, also pro bono, to help with web population and to smarten up the website to make it fit for purpose (time is not our friend and we do have a lot of catching up to do). The website has been built using Drupal. Interested persons should contact Bob O’Shea as below or any committee member. Knowledge of html, Word, Excel and some interest in design would be especially helpful. 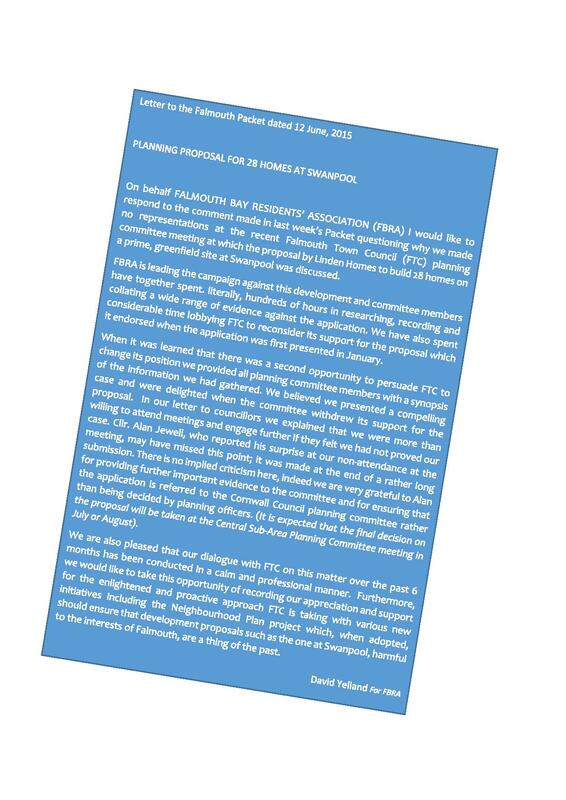 To all those members who emailed their thanks for the success of the planning denial at Item 1 above. It makes it all worthwhile for the committee and encourages us to better things. That said we trust the tide is turning on greenfield applications and that planners concentrate on house building, including affordable houses, on the many brownfield and other more appropriate sites in our neighbourhood. Planning applications for week ended 4 July is attached. The planning information for the week ending 20 June 2015 is attached in pdf form. Additionally the following information on current applications shows that in respect of developments on PA14/12058, Linden Homes, Swanpool. We understand that this revised proposal will now be put to the Cornwall Council Planning Committee, most likely on 6th July. FBRA will issue a comprehensive appraisal of its own to this committee outlining why this greenfield site should never be built upon. There has been discussion with the relevant planning officer to ensure that all objections from the original application along with the further objections posted since the revised application was submitted by Linden Homes. The total number of comments on the Cornwall Council planning portal now exceeds 200 the vast majority of which object. Some of these comments are, of course, duplicated from the first proposal. Members might like to know that, following some slightly negative comment in the Falmouth Packet in the issue of 10 June, a letter from FBRA putting the record straight was published in the current issue dated 17th June, 2015. In respect of developments on PA15/03934, GO, Swanpool. The comment window for this application to build 6 chalet style homes on the wooded area between the cemetery and Swanpool Beach has now closed. The number of comments on the Cornwall Council planning portal exceed 60 of these 55 are from the general public and all are objections. FBRA provided a written objection which is on the website. 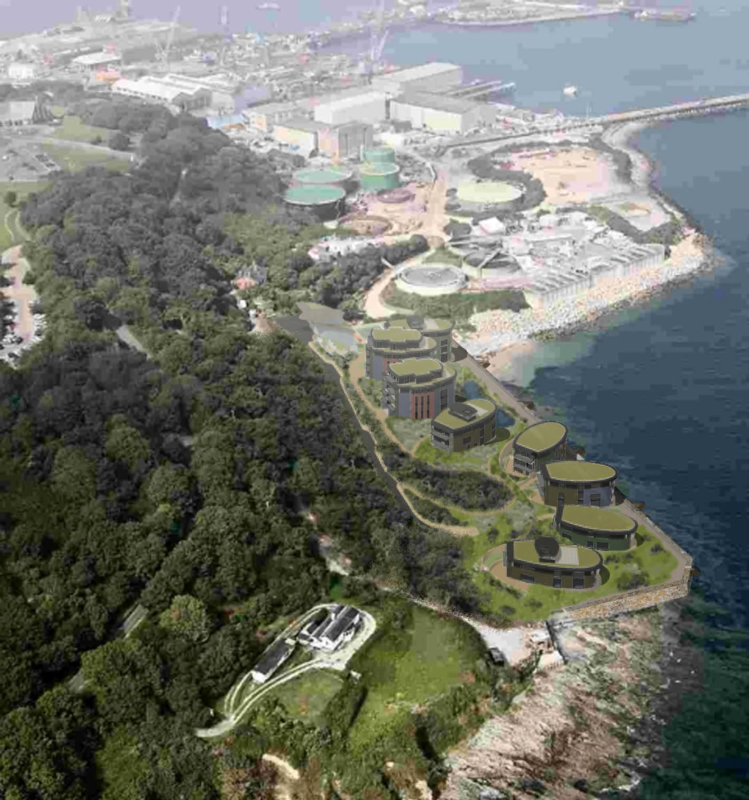 Falmouth Town Council has also objected to this proposal. After the special notice issued to members yesterday, 12th June it just so happens that there are no new planning or licence applications for this week. However FBRA has further communicated with the Principle Planning Officer at Cornwall Council in respect of PA14/12058, the Linden Homes original and revised application to point out that not sufficient comment has been made by him to the original commenters that a further and revised application has been made and that the administration of the planning process in this regard is flawed. We await his further response. 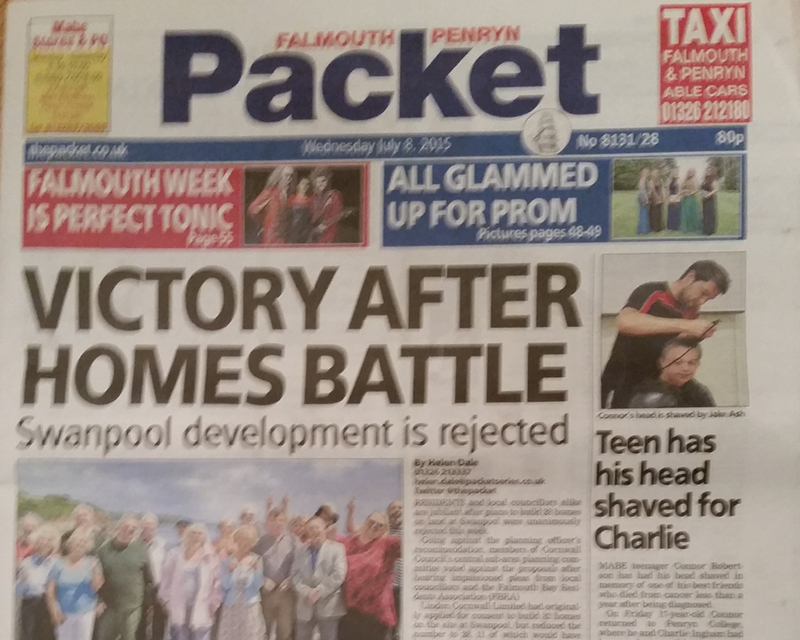 Those of you who take the Falmouth Packet newspaper will also notice the front page headline “HOMES PLAN IS OPPOSED” The article suggests that no objectors were present at the FTC-PC meeting on 8 June which is correct but comment in the Packet has caused some of you to ask what FBRA is doing and why did we not attend this meeting. Attached is a copy of FBRA’s letter to The Falmouth Packet which illustrates the amount of work FBRA has been doing behind the scenes and why we are where we are. It is attached in .jpg and .pdf formats. Planning applications for this week are as the attached pdf. Members are reminded that Falmouth Town Council Planning Committee meets on Monday 8th June to review the planning application PA15/03934 in respect of the further application for planning approval for 6 dwellings on the seaward side of the pool. This further encroachment on essentially virgin land makes the Neighbourhood Plan even more vital. Members who are concerned about this development should make their views known by making comment on the Cornwal.gov.uk website.